Health experts are warning parents against holding "swine flu parties" in the hope of infecting their children with the H1N1 virus. Talk of swine flu parties has emerged on Internet forums. The idea is that exposing a child to the H1N1 virus while it remains relatively mild will give the child immunity if the virus returns in a more virulent form later on. The idea is an extension of chicken pox and measles parties that were once a popular way of exposing children to those diseases so that they might acquire resistance to subsequent infections. But health officials have been quick to condemn the idea. Speaking at a conference, Dr Richard Jarvis, chairman of the British Medical Association’s public health committee, said “I have heard of reports of people throwing swine flu parties. I don’t think it is a good idea. “I would not want it myself. It is quite a mild virus, but people still get ill and there is a risk of mortality.” Last month, Richard Besser, the acting head of the U.S. Centers for Disease Control and Prevention, also warned against deliberately exposing people to the virus. While it’s not clear if any swine flu parties have been held, Justine Roberts, the founder of Web site mumsnet, today told BBC Radio 4 that some people have been discussing the idea. “We have heard of people saying ‘can we come round to your house when you get it” she said. “There’s definitely a prevailing view that it might be better to get it now and some people are not despairing if there is a case in their school.” Flu epidemics often come in waves and there are fears that a more virulent form of H1N1 may strike in the fall. That happened with the Spanish flu pandemic in 1918. Researchers at George Washington University in Washington DC have studied the 1918 pandemic and have found that in areas where there were more cases during the first wave of Spanish flu, there were fewer deaths during its second wave, in the fall of that year. The suggestion is that exposure to the first wave of the flu conferred immunity to its second wave. 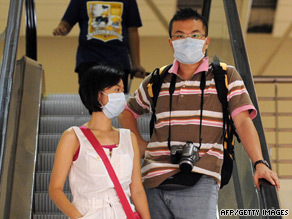 But H1N1 is still very much an unknown quantity. Experts warn that little is known about the virus and that actively encouraging its spread could risk the health of those who are most vulnerable. While the symptoms associated with swine flu are not usually life threatening among people in good health, it can be deadly for elderly people or those with other medical conditions. The latest figures from the World Health Organization show there have now been 311 confirmed deaths around the world from the H1N1 virus first identified in Mexico this spring, and just over 70,000 infections in 113 countries.